Every year during the month of March, BGMC runs its annual campaign called "March Missions Madness-Lost Change for Lost Souls." This campaign takes place throughout March. The month of March was chosen because National BGMC Day is the second Sunday in March. The purpose of this four-week campaign is to bring special attention to BGMC and what it does. The object of the campaign is to get every person in the church involved by looking for lost change (money) for one month in order to reach lost kids around the world. Lost kids are reached by supplying our missionaries with the supplies they need to spread the gospel. We suggest you give every person in the church a Buddy Box. These boxes come folded flat so they take up little storage space. Because they come folded flat, they fit into church bulletins. This is an easy way to get a BGMC offering container to every church person. The Buddy Boxes are the size of a juice box container. These boxes are also more cost effective for BGMC. Challenge the congregation to search their homes, cars, sofas, washing machines, dresser drawers, etc., to find change that is "lost." By giving this lost change to BGMC, lost souls will be reached with the gospel. The Buddy Boxes are to be turned in when they are full. Some people will fill them in one week, so give them another box to fill. Announce that all boxes should be turned in on the last Sunday. Some people will continue to fill their boxes throughout the year. "Lost Change for Lost Souls" will create excitement among the kids and adults in the church as everyone gets involved in gathering money for BGMC. Adults will have opportunity during this month to show the kids their support. The adult support will instill excitement in the kids to get more involved in BGMC. This campaign is also a great way to boost your BGMC fund-raising for the year. March Missions Madness: Every March we receive tremendous reports from churches who testify about how much this campaign excited their church for BGMC. Many churches reported that more BGMC money came in during March than what had come in for the whole prior year. We also suggest that you show a BGMC video clip to the congregation and to the kids. Show a clip on the first Sunday that you announce March Missions Madness. You may want to show a clip every week. BGMC has great videos on DVD and on our social media channels. This website also offers many free downloadable videos available under the "Resources" tab. BGMC has created a great BGMC promo DVD called What is BGMC? (one for adults, one for kids). These powerful videos explains just what BGMC is, how BGMC is touching the lives of children around the world, and why your church should be involved in BGMC. 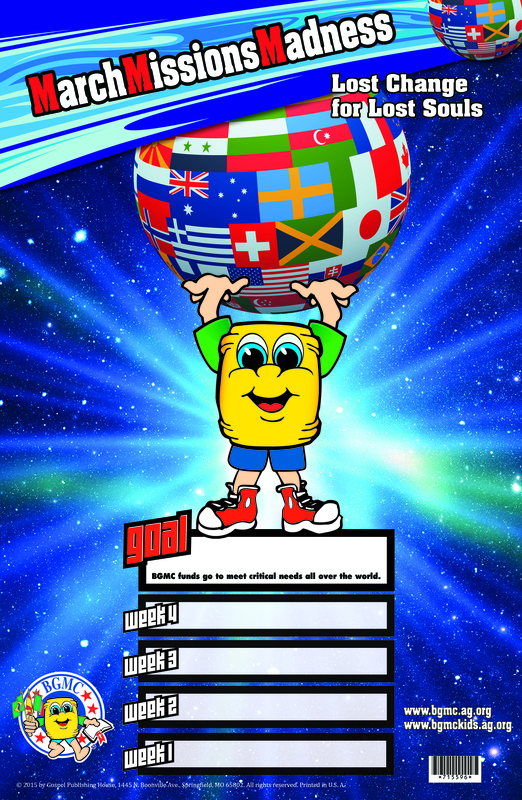 BGMC has created special free March Missions Madness posters to hang up around the church and in your classrooms so you can record the goal for March Missions Madness or the final giving total and record what has come in each week. For a detailed packet on how to get involved in this campaign, open the download below. My Healthy Church at 1-855-642-2011.